Michael Rooker, who has eight brothers and sisters, was born in Jasper, Alabama and studied at the Goodman School of Drama in Chicago, where he moved with his mother and siblings at the age of thirteen, after his parents divorced. He made his film debut in 1986 playing the title role in Henry: Portrait of a Serial Killer, a film based on the confessions of serial killer Henry Lee Lucas. He has since appeared in numerous films over the years including Mississippi Burning, Sea of Love, Days of Thunder, JFK, Cliffhanger, Tombstone, Mallrats, Rosewood, The 6th Day and Jumper. He has also guest starred in the TV series Stargate SG-1 and Crime Story. In 2010, he starred in James Felix McKenney’s horror film Hypothermia, which was co-produced by Larry Fessenden and set in New York. In June 2010 he revealed via Twitter that he was to appear in the AMC television series The Walking Dead. 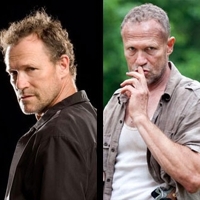 In the series, he portrays Merle Dixon, one of the survivors of a zombie apocalypse.